What one learns from Stampedes? One more tragedy has struck people, which shows that the governments do not learn from past experiences. And this time too, a pilgrim centre has become deathbed for scores of devotees. Tragedy revisited the Ratangarh temple in Datia of Madhya Pradesh after a gap of seven years when around 115 were killed on October 13 following a stampede triggered by rumours. This is not the first time that a pilgrim centre has become a tragic spot. The 1954 Kumbh mela saw 300 to 800 (the accounts vary, Guardian says 800, Times say 350) people killed in a stampede. A Wikipedia entry, quoting several books and newspaper reports, suggest that the Kumbh Mela has traditionally been used by politicians to connect with mass gather of Indian populace prior to the India’s Independence, and as this was the first Kumbh Mela after the Independence, many leading politicians had visited the city during the event, which goes for over 40 days. After the event, Prime Minister Jawahar Lal Nehru suggested that politicians and VIPs may not visit the Mela,who were all but exonerate along with the government after the inquiry of any wrongdoing. At Ratangarh, the reasons were different but till now there is no concrete evidence to suggest the correct reason. It ranges from rumours about collapse about the bridge to a lathicharge by police. It is also speculated that the police resorted to lathicharge to make way for a BJP leader headed to the temple. Whatever the reasons may be, the tragedy shows that the state governments have not learned any lessons. It is not that the governments cannot prevent such incidents. The Muzaffarnagar riots and the Odisha cyclone show that if there is a will, a government can do anything. In Muzaffarnagar, the UP government faltered and there was a communal riot which claimed over 50 lives and at least three women gangraped. In Odhisha, the cyclone Phailin did strike, but timely action could prevent many loss of lives. Close to 1,400 people have been killed in stampedes across the country in the past around six years, but state governments appear to be in inertia when it comes to taking preventive steps. No pro-active steps are taken on the Centre’s guidelines to prevent such incidents. The tragedy at Ratangarh temple in Madhya Pradesh’s Datia district during ‘Navratri’ festivities saw at least 115 people losing their lives on Sunday. Before this, a similar stampede in Pullumedu in Kerala’s Idukki on January 4, 2011 had claimed the lives of 102 pilgrims who were on way to Sabarimala. 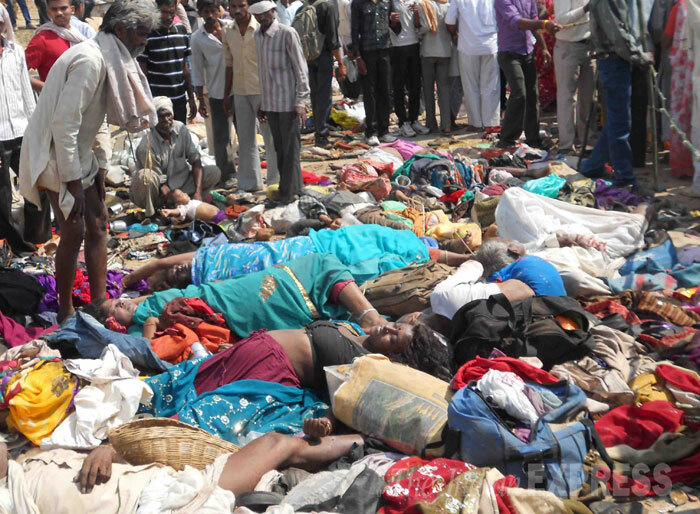 The Ratangarh tragedy is one of the biggest stampedes in the past six years. The same temple had witnessed a similar tragedy in 2006 in which 56 were killed but it appears that the state government did not learn the lessons. Last year too, Ratnam district in Madhya Pradesh witnessed a stampede in Hussain Tekri Shariff where 12 people were killed and four injured. 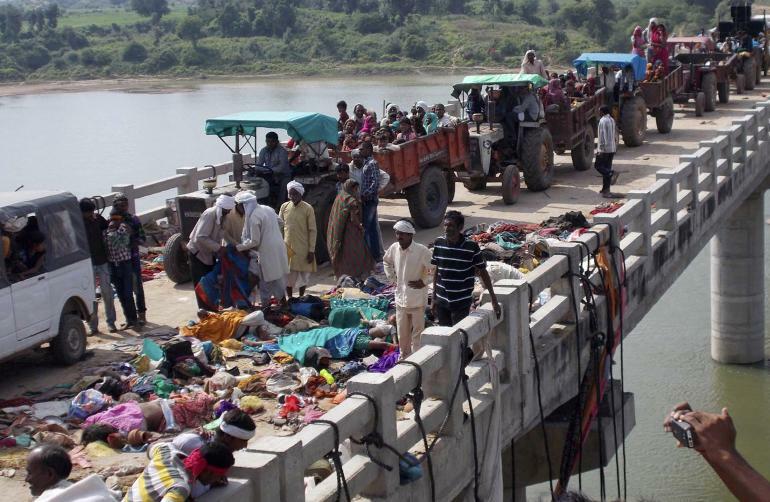 According to government figures, a total of 1,368 were killed, including those in the Ratangarh incident, and over 320 injured in 19 stampedes since January 2008. Earlier in February this year, 37 people were killed and 43 injured in a stampede at Allahabad railway station during Kumbh Mela. 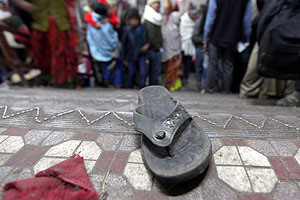 In October 2008 after a stampede in Chamandevi temple in Jodhpur that killed 147 people, the Union Home Ministry had issued detailed guidelines for the state governments on preventing stampedes, which included measures to efficiently manage such gatherings for safety and security of people. The advisory, which is periodically issued after updating it, emphasises the need for managing big gatherings. It has suggested measures like allowing manageable number of persons to visit temples or shrines at a particular time, proper access control procedure at every entry and exit point, establishing sound alert system and regular training of staff in evaluation procedures. Most of the stampedes have taken place in a religious place during a festival. The arrangements for this kind of events are made by the district administration and states. Authorities at districts and states should take all precautions to avoid any untoward incident. On the basis of inputs received from security and intelligence agencies, the Centre does issue specific advisories from time to time. However, it appeared that none of the steps were taken at Ratangarh temple by the district authorities. We have to wait for a detailed inquiry report. Initial reports suggested that there were just a handful of policemen to handle a crowd of about one lakh. It is to be seen what triggered the stampede as reports oscillate from a rumour about possible collapse of a bridge the pilgrims were crossing to a lathi charge by police, who were also accused of allowing vehicles on bridge after taking bribes. The state governments are not taking steps in advance to prevent despite knowing about the possibility of gathering of a large number of people. The politics in in full play. Allegations are thick and flying in Madhya Pradesh which is going to polls in late November. There are demands for resignation of Chief Minister Shivraj Singh Chouhan. A judicial inquiry ordered by Chouhan may be a ‘vazhipadu’ and nobody will be held responsible. Let us see what will our state governments learn from this stampede.